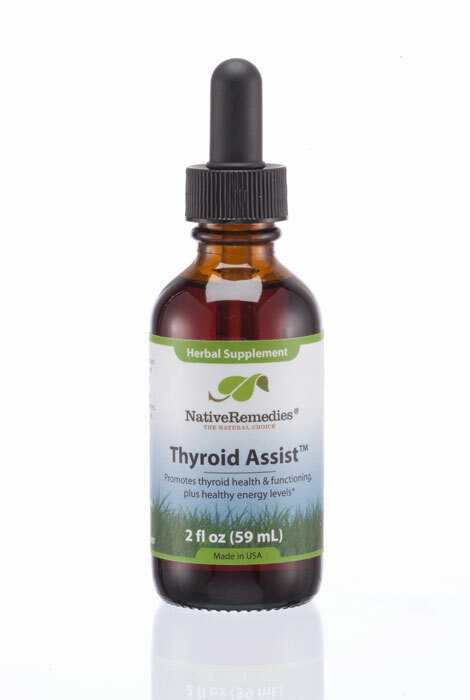 NativeRemedies® Thyroid Assist™ - 2 oz. Thyroid Assist™ is the premier safe and effective, non-addictive, natural thyroid remedy to optimize performance of the thyroid naturally. It is specially formulated for the natural activation of thyroid hormone to ensure adequate production of thyroid hormone and support healthy thyroid gland functioning. Formulated by our team of experts in natural medicine, Thyroid Assist™ is the ultimate herbal thyroid supplement and has been used for many years to safely boost energy levels and metabolism, helping to improve weight management efforts and balance emotions. To ensure the safety of Thyroid Assist™ and provide the highest quality, most effective product, we use only Premium Whole Herb manufacturing. This process excludes the use of any chemical solvents during extraction and maintains the balance of the whole herb to give you the very best possible safety, quality and efficacy. This is unlike other products that use standardized extracts, exposing the ingredients to harsh chemical solvents and removing the supporting metabolites from the plant. This thyroid health supplement contains a unique and scientifically chosen selection of herbs known for their beneficial effect on thyroid functioning, as well as on overall systemic health. Thyroid Assist™ contains Bladderwrack, a sea vegetable that is a prime source of iodine, an ingredient that is crucial in the activation of thyroid hormone production. It is also used for healthy metabolism and can be found in many slimming remedies. 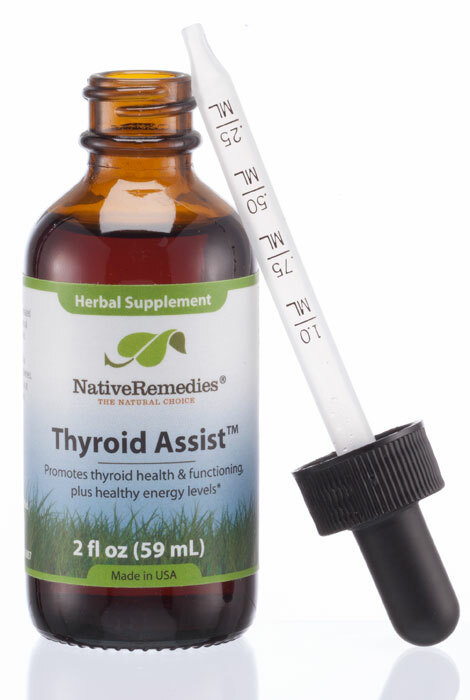 Thyroid Assist™ is a 100% herbal formula and contains the following ingredients in therapeutic dosage: Bladderwrack, Oatstraw, Makandi. 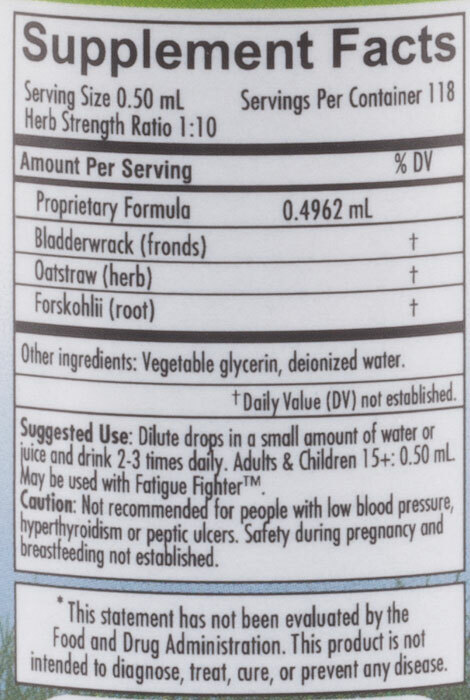 One bottle of Thyroid Assist at full adult dosage (0.50 mL 3 times daily) will last approximately 40 days. Caution: Do not take Thyroid Assist if you have an overactive thyroid. Thyroid Assist is not recommended if you have low blood pressure or peptic ulcers. Consult with your doctor if you are already on prescription medication. If you are taking a natural thyroid remedy, it's important to have your thyroid checked regularly (at least every six months) to ensure hormones are within safe ranges. If pregnant or breastfeeding, ask a health professional before use. If symptoms persist or worsen, consult a health care professional. Keep this and all medicines from the reach of children. People can differ widely in their response times to natural remedies depending on individual makeup, lifestyle and diet. Some may experience a general feeling of wellness within days, while for others it may take longer before an effect is felt. Often, as in the case of all good tonics, a gradual improvement is felt over time. Best results are achieved when Thyroid Assist is used consistently along with a healthy lifestyle. I have issues with being cold. I am trying this to see if it helps.